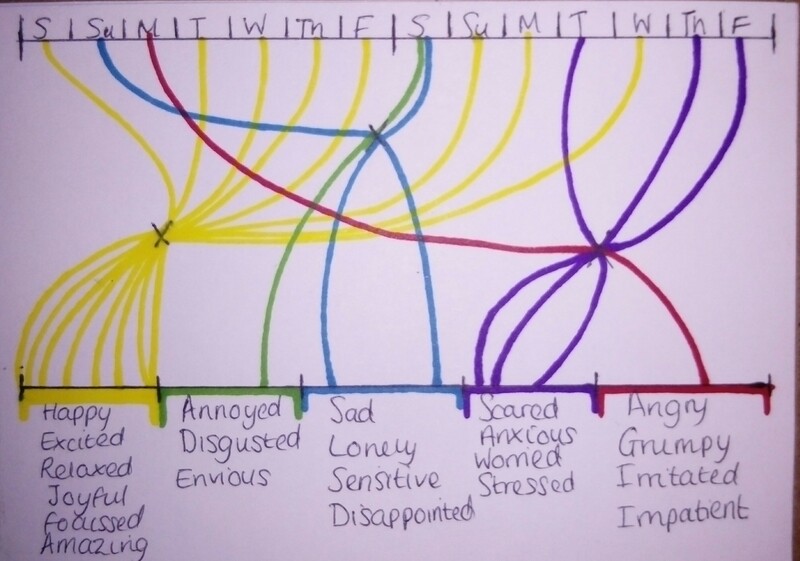 This postcard was formed using data collected over two weeks tracking my daily emotions. To visually represent this, I groupes sets of similar emotions and used a colour to symbolise them. As for the layout I used a “follow the line” theme. Each person will run through a series of different emotions, I have only chosen the dominant emptiness of the day. I questioned the reliability of this as I was only logging at the end of the day. If an emotion was overwhelmingly strong in the last hour of the day this may jolt my judgement of the day. I experimented with a variety of ways in which I could layout my findings. The first idea was to have two “meeting” or “middle points”, this became to busy and blurred. I then tried splitting the two weeks roughly into three, this again looked messy. I realised the issue came from the mixing of colours. 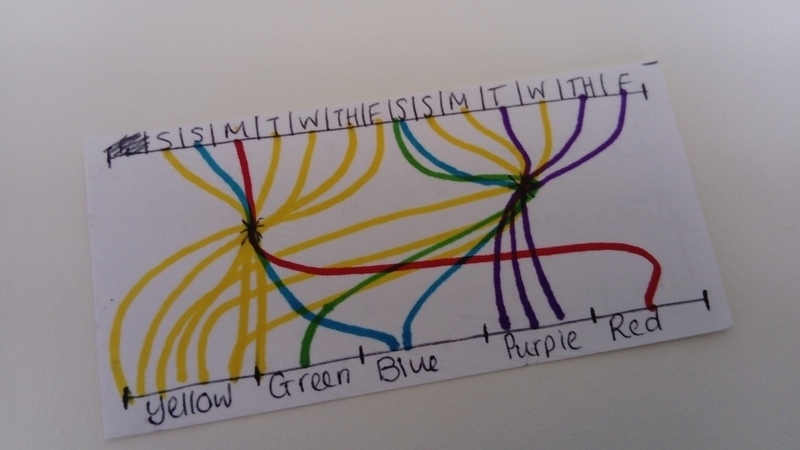 This triggered using three meeting points the first being only yellow, the second green and blue, and the third red and purple. I have been exploring fears and terrors through a Sketchbook this summer, particularly my own personal fears. 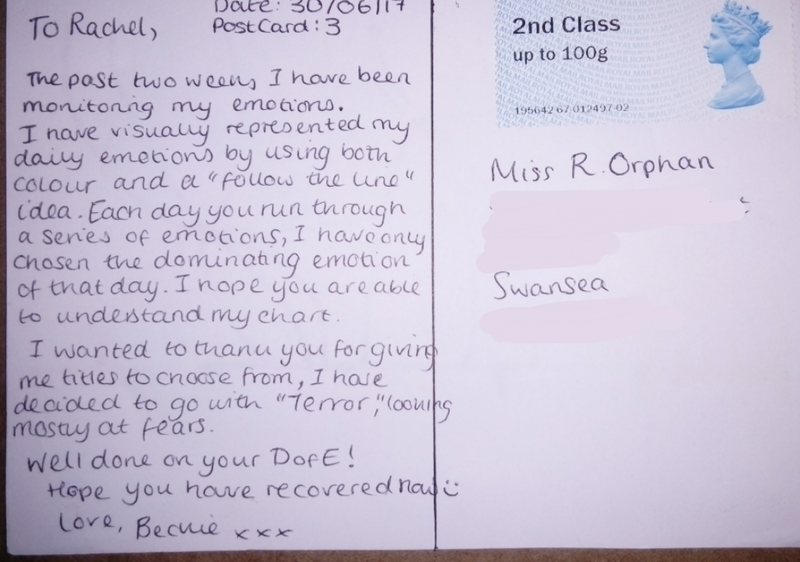 This postcard has made me feel much more secure and pleased with myself. The majority of these two weeks were yellow which are all positive emotions.